One of my good friends from grade school through high school, who I still actually stay in touch with is Matt Denning. Early one Saturday morning, a few months ago, while I was out of town, I rolled over to check my phone and see what time it was. I noticed that I had gotten a text from Matt, saying, "I'm heading to China in a couple of weeks, and I'm taking Galaxxor with me." Rolling back over and drifting off to sleep, I wondered to myself why Matt was going to China. I was also pretty sure that Mr. Denning doesn't own any Galaxxors. That's when I realized that the text wasn't from Matt Denning, but, in fact, Matt Doughty! I've been making Galaxxors, with the help of my good friend Marty "The Godbeast" Hansen, for over 5 years, now. Transitioning to a vinyl figure has been the plan from day one. 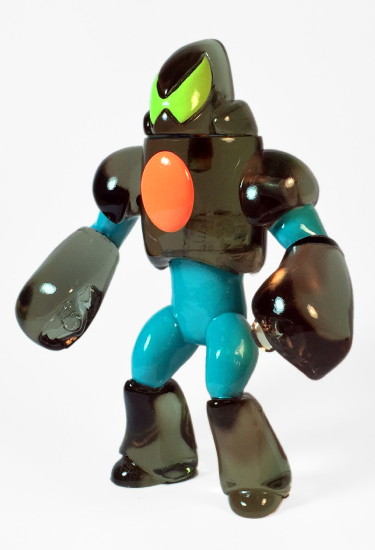 Having been a long time admirer of Onell Design and the Glyos System, it soon became obvious that the best way to bring old Galaxxor to life in production vinyl would be through the Glyos factory in Hong Kong. 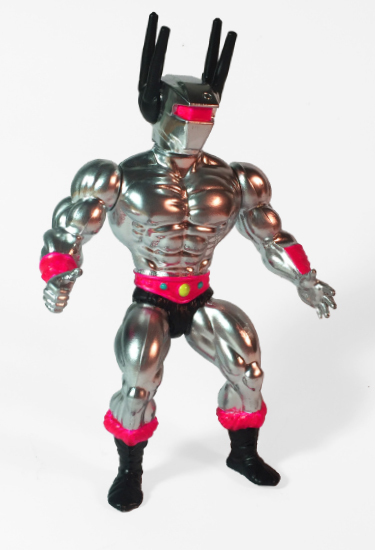 As the years went on, I developed a friendship with Matt from Onell, and the prospect of a Glyos vinyl production Galaxxor eventually became a reality. In the Fall of 2015, the process began. The amount of support and guidance that Matt and Marty have given me with this phase of the Galaxxor project is beyond value. There is absolutely no way that I would have been able to do this without their wisdom. There is a great deal of their design expertise in this production figure. Seriously, those guys deserve some sort of an award, or something, for putting up with me and all of my changes. Ha! Pictured above are what are called "Mold Masters". 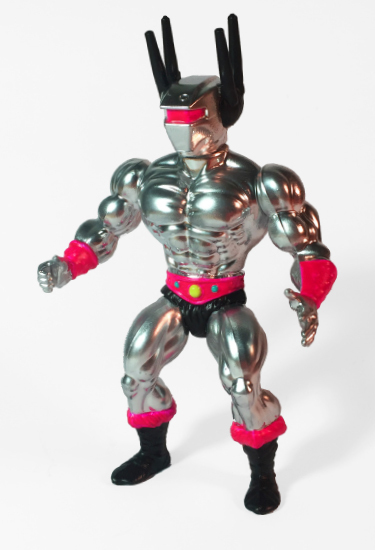 They are pre-production vinyl prototypes from which the steel molds for full production vinyl figures get made. 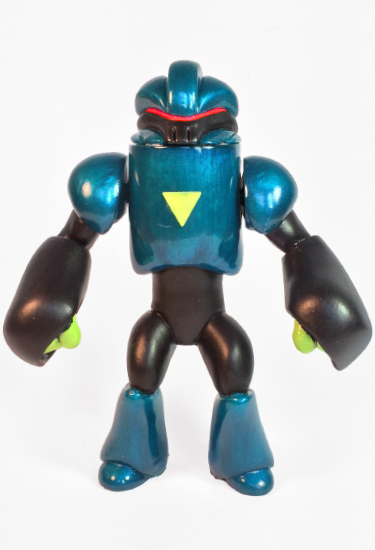 Vinyl Galaxxor will be a full sized 5.5" figure with articulation at the head, arms and waist(below the chest). Each figure will include both the dome and the Cyborg space Barbarian head. 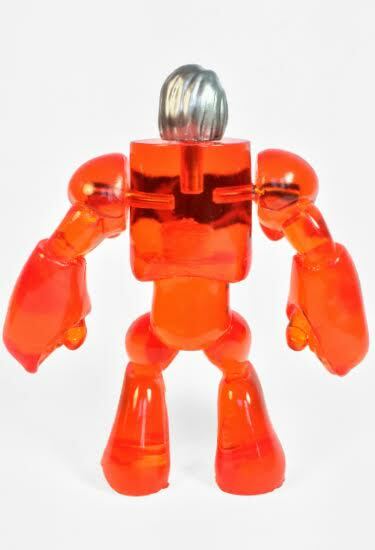 All pieces will be compatible with other Glyos System vinyl. I'm currently making a couple of minor adjustments (which have pushed back the official release date a bit), but these images are fairly indicative of what the final production figures will look like. The plan for now is to release these in waves, with various paint decos, and eventually diy editions. Fingers crossed, super limited edition test shots and the first wave of releases should be popping up in the early months of 2016. In one sense, it has been quite a journey to get to this point, but in another, the journey is really just about to begin. Thanks to everyone who has supported me, up to this point. I can't wait for you to see what I have in store! Speaking of "in store". I've still got a couple of leftovers from Designercon up in my online shop. These are probably the last resin Galaxxors. So, jump on them if you still want one. My friend John, over at Dollar Slice Bootlegs has been making some amazing stuff over the past couple ov years. He's a truly talented artist with a mind for the absurd and an eye for design. At one point, a while back, we came up with the idea of doing a collab. 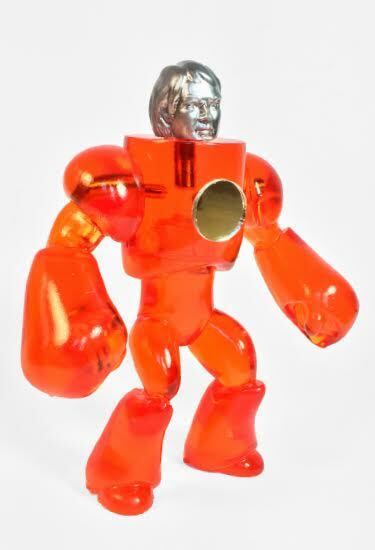 At the time, he had just dropped Mr. Ca$h Grab, a resin mashup figure sporting a Macross Valkyrie/Jetfire head. 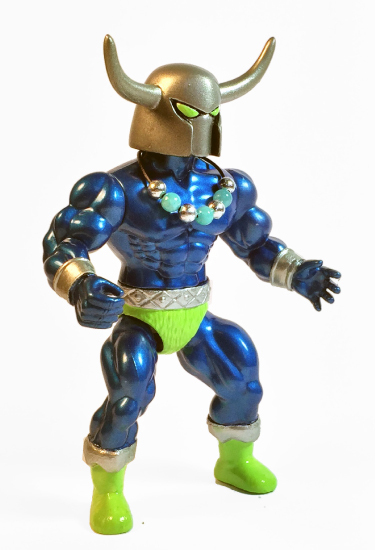 Of course, me being me, I was like, "Hey, let's put that thing on a vintage MOTU barbarian buck!" Around the same time, I was discussing with my man Brandon over at ManOrMonster? Studios, his method for a very reflective silver (nearly chrome!) finish that he was getting. Ideas started rumbling around in my brain. ROM the Spaceknight snuck in there. And then, one night, I had a dream about a character named "Starjack". It all just sort of fell together. 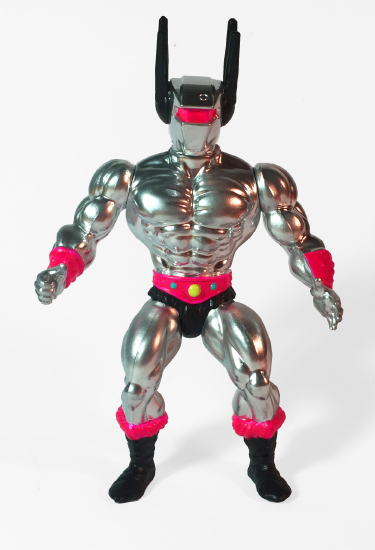 Once the greatest robot hero of a far off dimension from an alternative timeline, The Mighty Starjack fell from grace and descended into madness. He found himself stranded on a primitive planet, occupied almost entirely by giant reptilian beasts and man eating plants. Over the centuries, Starjack changed, evolved. He took on a far more barbaric form, and over time rose to dominance over the beasts of his strange new home. In the dimension shattering swirl of the Cosmic Supernova, Starjack found himself plucked from his own timeline and thrown directly into the heart of the Galaxxorverse. Mentally revived, and more physically powerful than ever, the Mighty Starjack stood beside Galaxxor 015 in the battle against Gorgax and his evil forces. 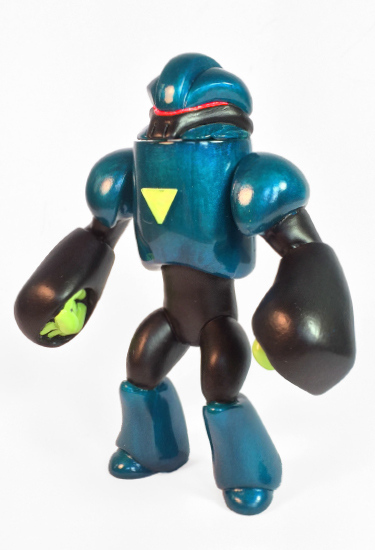 Starjack is a 5.5" custom art figure that features 2 points of articulation (arms). 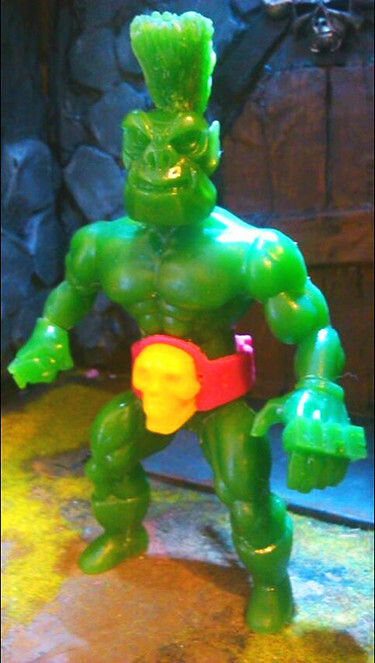 The head was cast in resin by Dollar Slice Bootlegs and the body is a restored vintage MOTU barbarian buck. Painting duties were handled by Ben Spencer. Starjack comes in a bag and header packaging, is limited to an edition of 5, and will be $75, each. 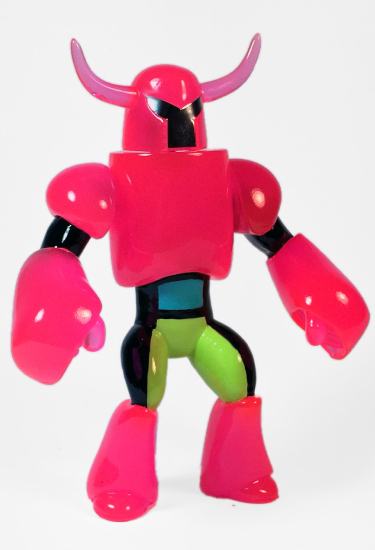 The figure will be exclusively available at Nerd City's booth #1003 at Designer Con, November 21st and 22nd. That may just be it for the Designer Con announcements. Believe it or not, the Galaxxor project just turned 5 years old. It has been a process of learning, developing, missteps, learning from missteps, honing skills, and figuring out what I actually wanted to do. 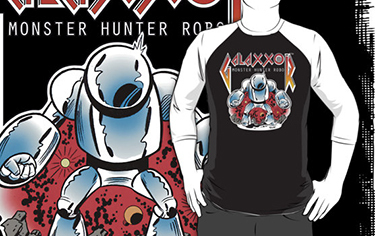 Along the way, the help and support of Marty "The Godbeast" Hansen and Matt Doughty has been absolutely crucial to Galaxxor's growth. And those guys have continued to support and guide me, as I work toward the next phase of The Galaxxorverse. 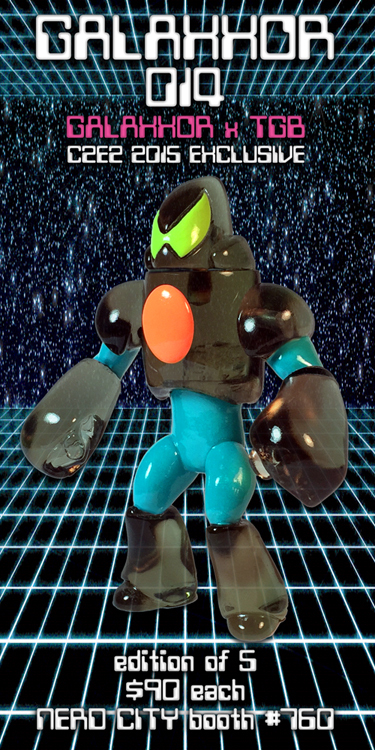 So, I felt it was only appropriate that the last (for the foreseeable future, at least) resin 5.5" Galaxxor figure should highlight their amazing contributions. The head sculpt of Galaxxor 015 is all Matt Doughty. We've seen it a couple of times before, years ago at NYCC and a couple of years ago with Infection Galaxxor. 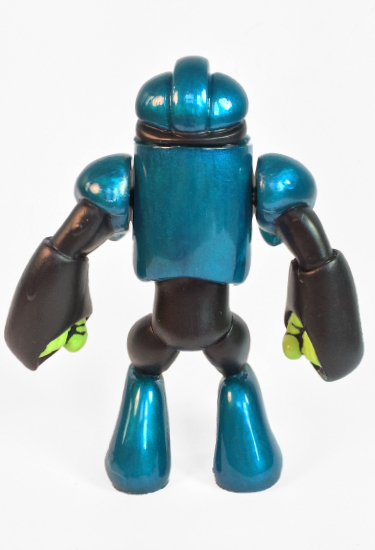 The figure is cast in an absolutely gorgeous swirly metallic teal by Mr. Godbeast, himself. Chronodar's manipulation of the Alpha timelines resulted in a Cosmic Supernova. Swirling, crackling green energies formed into a cosmic vortex right outside of the Anubis-5 system. Realities began converging and colliding. Infinite variations of instances occurred simultaneously. The Alpha was imploding. Imbued with the power of Ollen, the wise Space Dragon, Galaxxor 015 flew directly into the heart of The Cosmic Supernova. Summoning all of the power of The Alpha, he forced the rift shut, folding realities in upon one another. Sonic booms and built to a fever pitch. People and things ceased to exist. Other entities appeared out of nowhere. Order had returned to The Galaxxorverse. 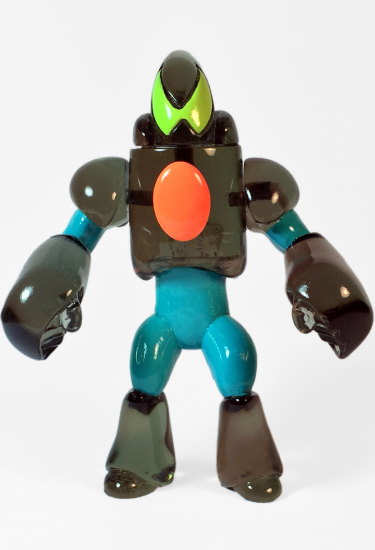 Galaxxor 015 is a 5.5" resin art figure that features 3 points of articulation (arms and head). The figure was hand cast in resin by The Godbeast. The original head sculpt is courtesy of Matt Doughty. The original body sculpt and painting duties were handled by Ben Spencer. Galaxxor 015 comes in a bag and header packaging, is limited to an edition of 5, and will be $90, each. The figure will be exclusively available at Nerd City's booth #1003 at Designer Con, November 21st and 22nd. Stay tuned for more exclusives, and some truly reality-shattering announcements coming up in the next couple of weeks. See you at Designer Con! First of all, apologies for the long time of blog silence. A lot has been going on behind the scenes, and the world of Galaxxor is about to get much, much bigger in the very near future! Which brings me to Designer Con! Nerd City will be out in force on November 21st and 22nd at the Pasadena Convention Center in Pasadena, CA. I'll be there with an abundance of Galaxxor goodies, along with Battle Babies, ManOrMonster? Studios and possibly Frenzy Bros. in Nerd City's booth #1003. Designer Con will, for Galaxxor, be both the end of an era and the beginning of a new era. 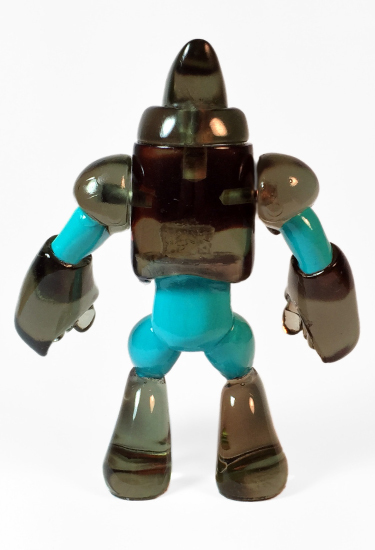 The resin Galaxxor pieces from myself and The Godbeast will probably be the last you will see for quite some time. So, I really wanted to pull out all of the stops with my con offerings. And first up is SPACE GOD CHRONOTAR! Featuring a traditional Galaxxor buck, beautifully cast in translucent orange resin by the mighty Godbeast, and a head cast in resin by the incomparable ManOrMonster? Studios, Chronodar is a continuation of the pantheon of the Seven Space Gods of the Galaxxorverse. 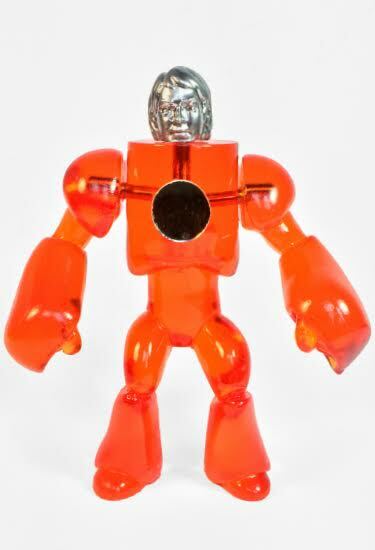 He's also a "tip of the hat" to the iconic Micronauts Time Travelers figures. The Seven Space Gods, the overseers of The Galaxxorverse, use their cosmic powers to maintain order in the reality that is most commonly known as "The Alpha". It is they who direct the Galaxxors to travel from world to world, protecting humanity from the monstrous clutches of chaos and evil. Among the Seven, Chronodar is uniquely powered, via his Infinity Mirror, with the ability to briefly travel forward and backward within the timestream of The Alpha. He manipulates it so that humanity and order may persevere. The Alpha is a complex web of reality, and its temporal nature is only truly known by Space God Chronodar. 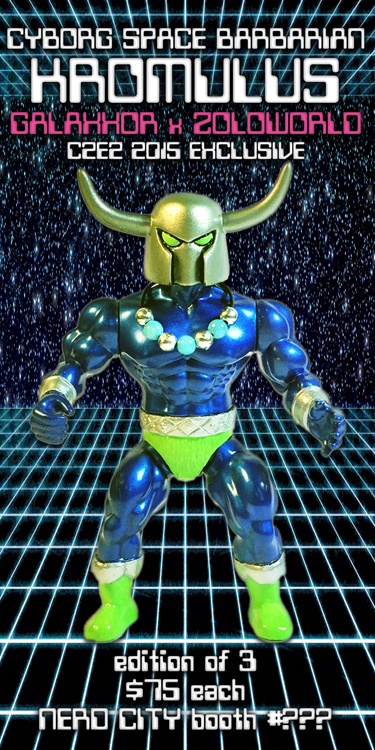 Space God Chronodar is a 5.5" resin art figure that features 3 points of articulation (arms and head). 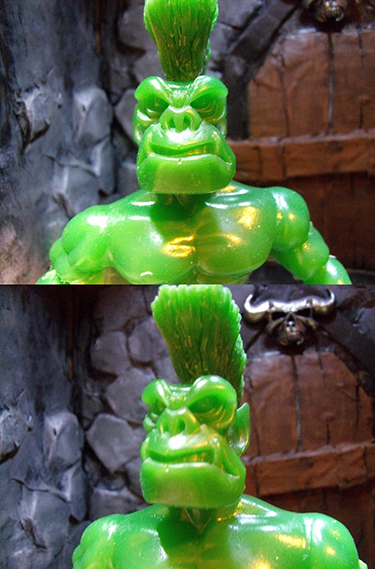 The body was hand cast in resin by The Godbeast and the head was hand cast in resin by ManOrMonster? Studios. The original sculpt and painting duties were handled by Ben Spencer. Chronodar comes in a bag and header packaging, is limited to an edition of 5, and will be $90, each. 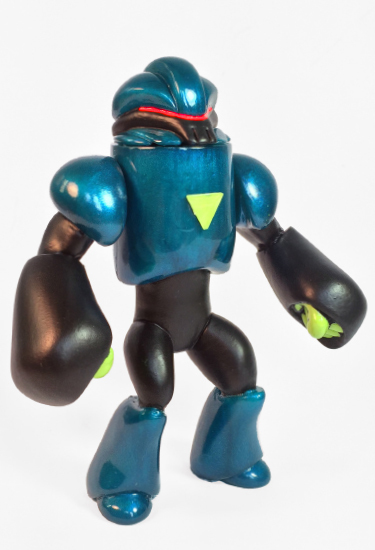 The figure will be exclusively available at Nerd City's booth #1003 at Designer Con, November 21st and 22nd. Stay tuned for more exclusives, and some truly reality-shattering announcements coming up in the next few weeks. See you at Designer Con! Once a ruthlessly savage warlord from the planet Orkamania, Fugg the Slayer is now one of the most feared combatants in the fighting arenas of the hive planet X-544. 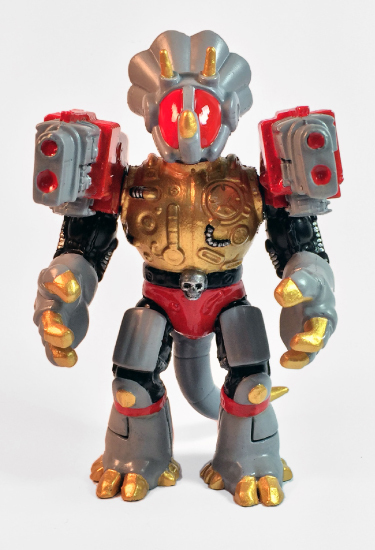 Tasked by a wealthy hive aristocrat with hunting down a suitable opponent for The Lucha Sharks, Ciper the Bounty Hunter captured Fugg from his home planet and brought him to X-544. Every bit as flamboyant as he is violent, Fugg now stands at the top of the ranks of the hive world arena fighters, terrorizing even The Lucha Sharks! 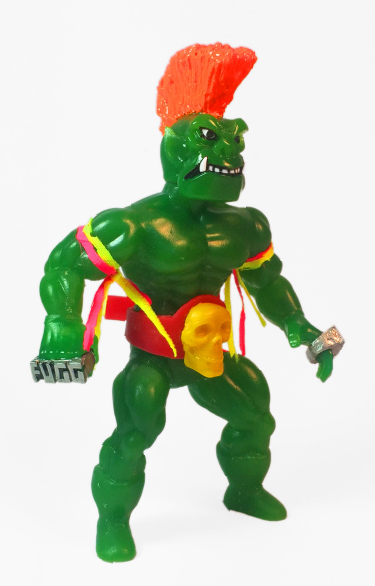 Fugg the Slayer is a 5.5"-style art figure that features a head and hands that were sculpted/mashed up by Ben Spencer, and a body buck and removable championship belt that was sculpted/mashed up by the mighty BigManToys. The head and hands are cast in resin, but the body and belt are cast in a softer polyurethane rubber. Both resin and rubber production were handled by Bigmantoys. 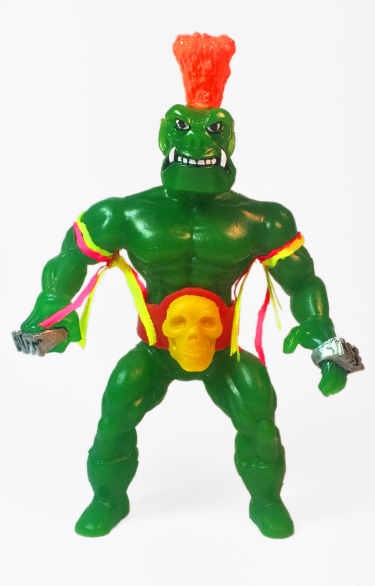 Fugg is also hand painted by Ben Spencer, and he features soft goods arm bands and neck articulation. Fugg the Slayer comes in bag and header packaging. 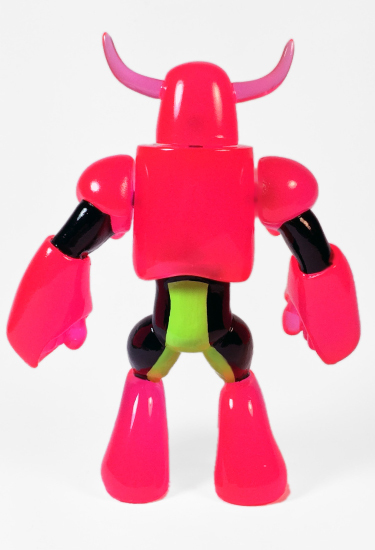 He will be limited to an edition of 5 at $70 each, exclusively through The Galaxxor Online Store on 07.31.15 at noon CDT. 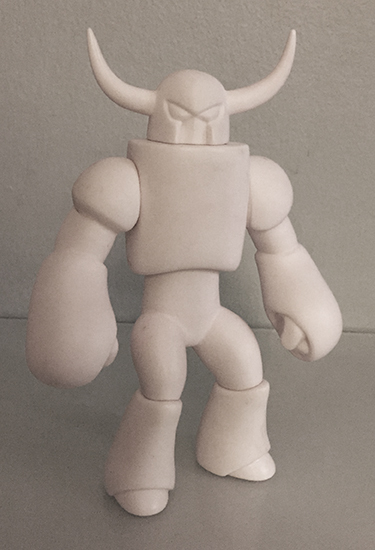 Fugg the Slayer, Coming Soon From Galaxxor x BigManToys! A collaboration between BigManToys and yours truly has become an annual event of sorts. Lee from BigMan is an extremely talented artist who I'm honored to call a peer and a friend. Recently, Lee created a new one piece 5.5" buck. Ideal for customization, the buck, at it's core, is ideal for a wrestler-type character, but also suitable for a virtually endless amount of customization potential. 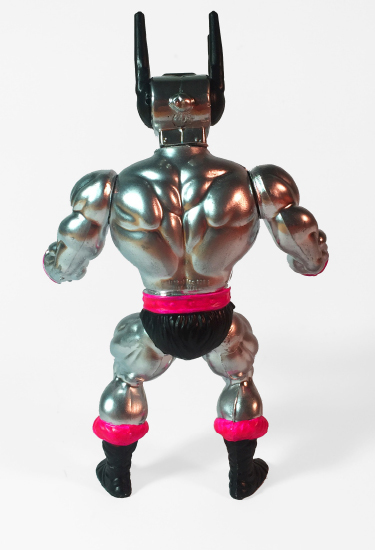 Running with the concept of BigManToys' new base body, and intrigued by the fact that it could be produced in a polyurethane rubber (similar to the old LJN WWF figures), I decided that I wanted to have a go at a wrestler-type dude. I've got a love of Orcs, dating back to my earliest days of playing D&D and extensively informed by all of the great Games Workshop media of the early 90's. So, it was a no brainer to try to sculpt/mash up the head of that great classic Orc action figure that I always wanted, but never got. I wanted to approach the design of the hands in a way that continued to develop the idea of the character I was beginning to see in my head- brutal, yet comedically flamboyant. I had come up with the name of "Fugg the Slayer" for this guy, so the idea popped into my head to create hands sporting brass knuckles/four finger rings that sayd "FUGG" and "LIFE". I also mashed together bits for a championship belt, featuring a skull from a vintage Nightmare Warrior. So, these are some snaps, courtesy of Lee, of the first pull of good old Fugg. The head and hands are cast in hard resin, but the body and belt will be in pu rubber. 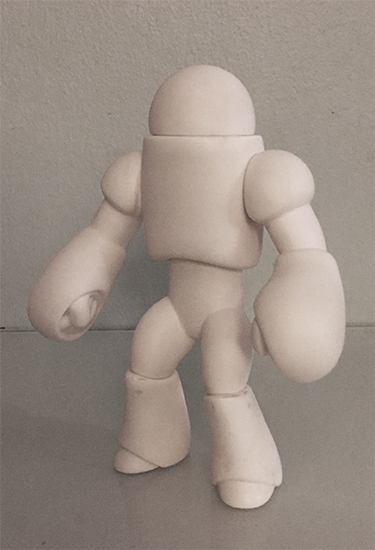 I intend to add some paint aps on the head and hands, as well as a couple of other little flourishes. The body material, however, doesn't accept paint, so that's going to stay solid green. BigManToys is currently finishing these up, and then they have to make the trip over to this side of the ocean for painting. But, I would imagine that I should have details about how you can get down with that Fugg Life in the next few weeks. Stay tuned! The Hippo Titan Soldiers of Kabbagiff are, primarily, a terrestrial military force. Using their imposing bulk and extraordinary skill with the blunderbuss, the Kabagiffian soldiers have helped push back the forces of gorgax and his Evil Mutant legions on many planets, throughout the Galaxxorverse. 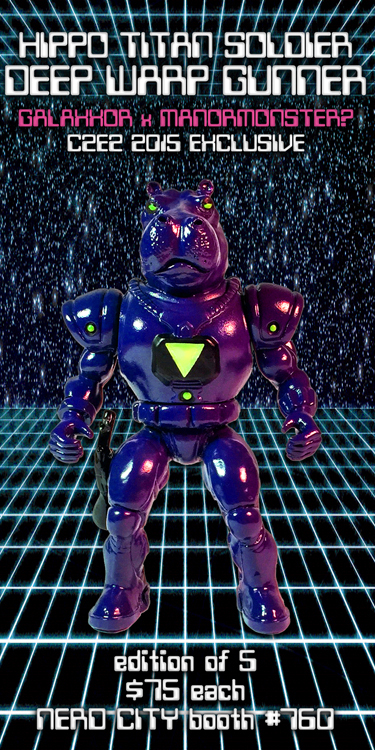 The Deep Warp gunners are the elite of the elite Hippo Titan Soldiers. Hand picked by Sgt. 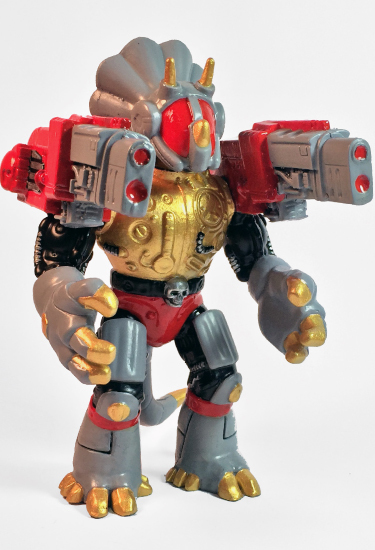 Krugg and equipped with special Deep Warp Conversion Armor, Hippo titan Soldier Deep Warp Gunners are ideal for outer space and inter-dimensional combat situations. 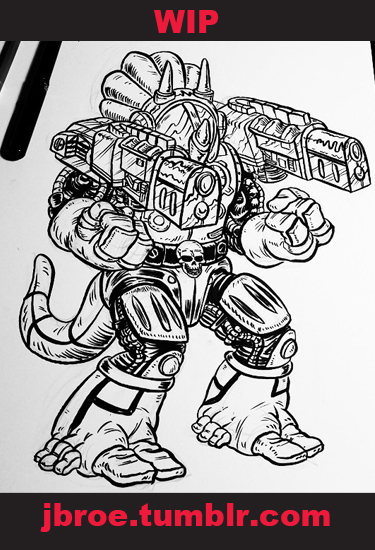 When General Gorgax unlocked the cosmic powers of the Omega Matrix, Infiniton of the Seven Space Gods tasked Galaxxor 014 to take an elite team of Hippo Titan Soldier Deep Warp Gunners to the digital city C2-E215 to battle Gorgax and his Cyborg Space Barbarian minions. The fate of the Galaxxorverse hangs in the balance of this epic conflict! Brandon Barker of ManOrMonster? 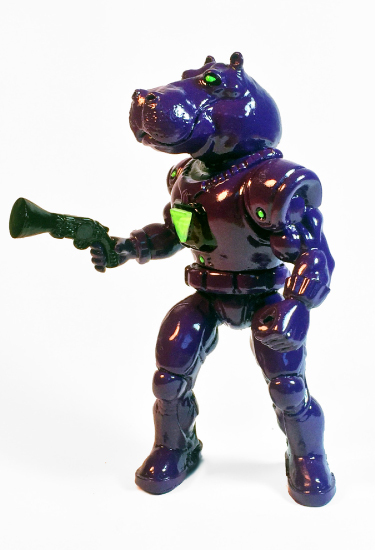 Studios and I made the first Hippo Titan Soldier almost two years ago, and we've been meaning to get back to another edition of them, but done in a slightly more far out colorway. 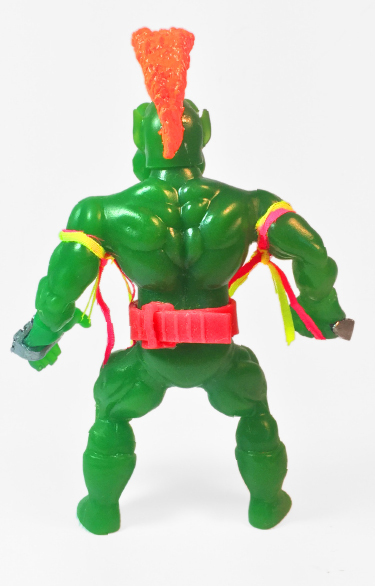 When we came to the decision to do one in a deep, glossy purple with neon green and black accents for C2E2, Brandon also suggested we revisit the original shoulder design of the figure. After a bit of back and forth design chat, Brandon came back with what you see here. He really did an incredible job of building upon the pre-existing aesthetic and taking the design to the next proverbial level. I'm incredibly pleased with how these came out and can't wait to do a few more editions of these bad boys in the future. 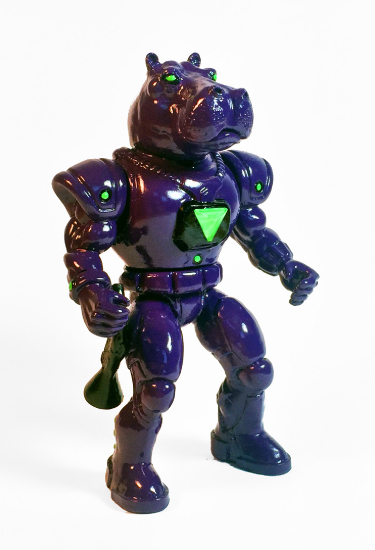 Hippo Titan Soldier Deep Warp Gunner is a 5.5" art toy that was designed and sculpted by Ben Spencer and ManOrMonster? Studios and engineered and produced in resin by ManOrMonster?. It was hand painted by Ben Spencer. 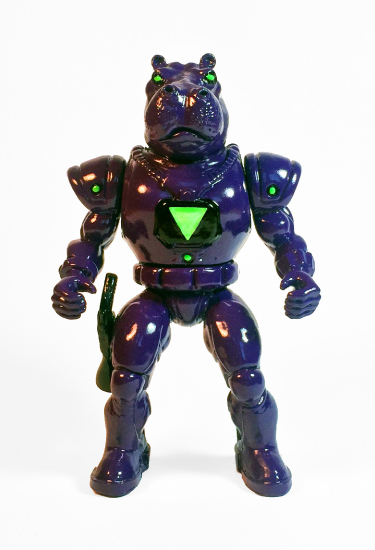 The Hippo Titan Soldier features 3 points of magnetic articulation at the arms and waist. It also features a magnetic blunderbuss accessory, which can be held in his hand, or mounted on his thigh or back. 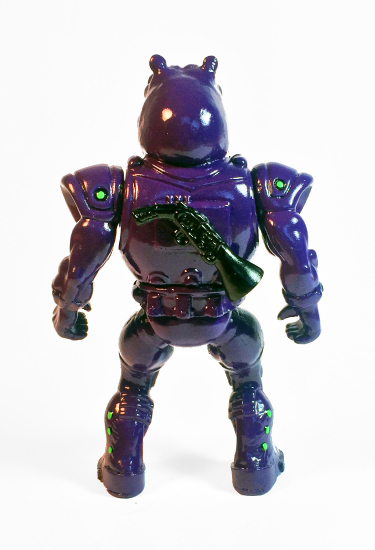 Limited to an edition of 5, The Hippo Titan Soldier Deep Warp Gunner will be $75 each and will exclusively be available at Nerd City's booth #760 at C2E2. C2E2 is just about a week away. Here in the home stretch, it's a mad dash to tie up loose ends, finish up projects and organize all of the madness that will be Nerd City's booth #760. I've got one more exclusive to announce, but I wanted to quickly share a couple of other cool little things that we'll have at the booth. 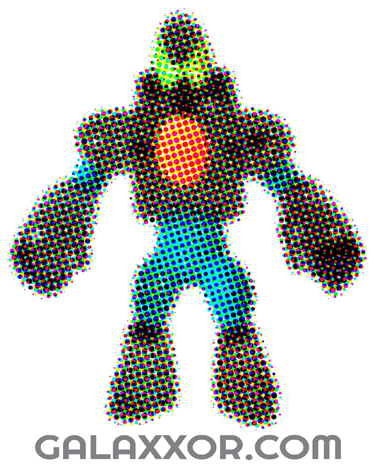 Pictured above is a new sticker that I'll be launching, the 5.5"x7" "Cosmic Halftone" sticker will be available for free for just popping by the booth, checking some Galaxxor goodness and saying, "Hi". 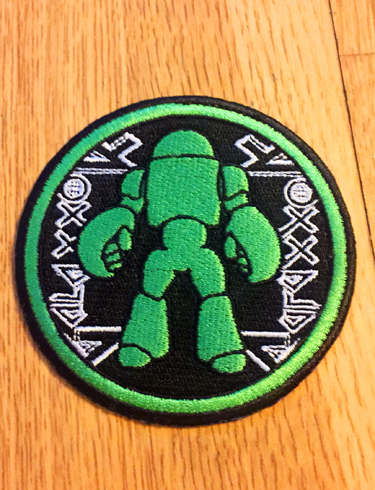 We'll also have this really great 3.5" patch that I did with my friend, Mark, from Until We Burn. This neon green/black/white patch is fully sewn and will be going for just $5 each as a con special. I'm really looking forward to seeing everybody at C2E2 this year. Stay tuned over the next week for a couple more updates and surprises! In the Galaxxorverse, there are many Galaxxors, but really only one General Gorgax. So, in essence, any Gorgax that I do from here on out will be a variant, of sorts. I've always had a soft spot for those super over the top variants of figures that they used to pump out in the 80's/90's. Who wants a neon green Scuba Attack Batman? No one. But, sometimes, those figures got so crazy that something beautiful happened. 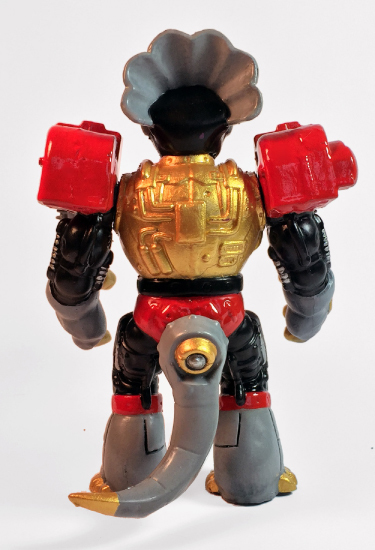 So, Omega Matrix Power General Gorgax is my tribute to that sort of figure, along with a tip of the hat to another iconic snake of a villain that rocked that iconic mirror chrome face plate. 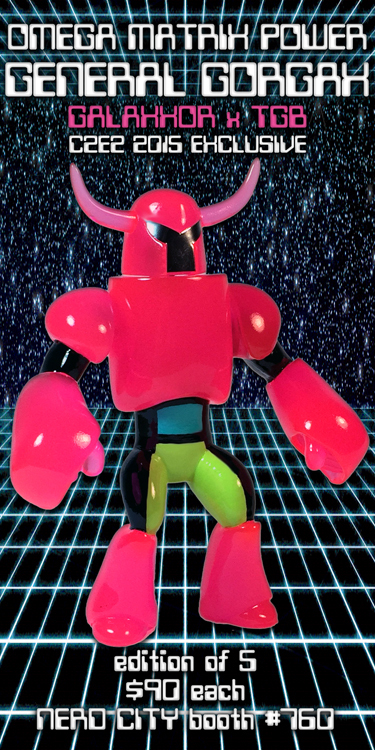 Omega Martix Power General Gorgax is a 5.5" art toy that was designed and sculpted by Ben Spencer and engineered and produced in semi-translucent neon pink resin by The Godbeast and True Cast Studio. Gorgax was hand painted by Ben Spencer. He features 3 points of articulation at the arms and head. Limited to an edition of 5, Omega Matrix Power General Gorgax will be $90 each and will exclusively be available at Nerd City's booth #760 at C2E2. The head of Galaxxor 014 is a new addition to our library of bits and its design goes back to a weekend I spent hanging out and sculpting at True Cast Studio a couple of years ago. Being a 40K fan, I always loved the look of the Eldar, and wanted to create something that called back to their iconic pointy helms, but that would also blend into the more bulky proportions of the Galaxxor buck. Somewhere along the way, a little bit of my love of late 80's/early 90's McFarlane art crept in there, as well. Marty "The Godbeast" Hansen and the boys at True Cast Studio really knocked it out of the proverbial park with the color of the translucent smoke resin base. In low light, it comes off as a super glossy dark gray, but in high light, it appears to be almost clear. I've always dug clear toys. There's something so cool to me about being able to see their inner workings through the material. I feel like Galaxxor 014 has a bit of that magic. 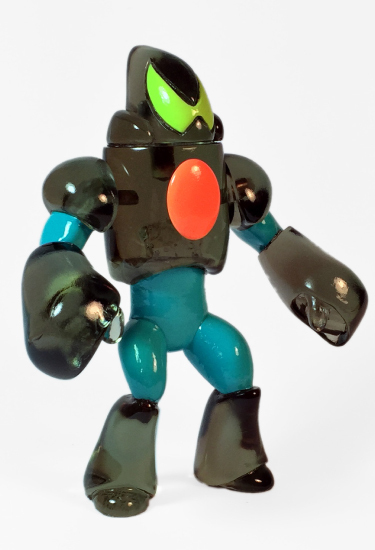 Galaxxor 014 is a 5.5" art toy that was designed and sculpted by Ben Spencer and engineered and produced in translucent smoke resin by The Godbeast and True Cast Studio. 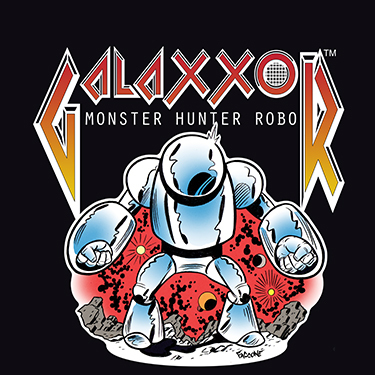 Galaxxor 014 was hand painted by Ben Spencer. He features 3 points of articulation at the arms and head. Limited to an edition of 5, Galaxxxor 014 will be $90 each and will exclusively be available at Nerd City's booth #760 at C2E2. As General Gorgax's elite goons, the Cyborg Space Barbarians are an essential part of the Galaxxorverse. 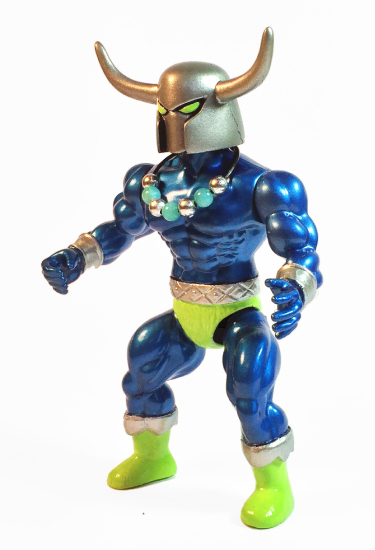 I love the way that the original helmet I sculpted came out, and I really enjoy making more barbarian-style characters, but as the core Galaxxor brand continues to evolve, I really wanted to move away from them simply being new heads on old MOTU bodies. My buddy Mike, from Zoloworld, and I have been chatting about doing some sort of collaborative work for a while, now. So, it only made sense to look to his awesome Realm of the Underworld line of vintage-style action figures as a possible base upon which to re-launch the Cyborg Space Barbarian concept.Originally conceived as a two-off project for Mike and I to see how the Cyborg Space Barbarian helmet looked with the Zoloworld barbarian buck, Kromulus got a great deal of positive feedback from the pictures that I posted online. So, I decided to do an extremely limited number of these guys as one of my exclusives for C2E2 this year. So, as opposed to using disused vintage figures for the bodies, the Kromulus figures will feature brand new Zoloworld bucks, which are then hand painted. They will feature 5 points of articulation, at the shoulders, waist and legs. Please let me know if this is something that you'd like to see more of in the future. I'd really like to work with Zoloworld some more, and it might be a cool opportunity to get some top quality Cyborg Space Barbarians into the hands of more collectors. 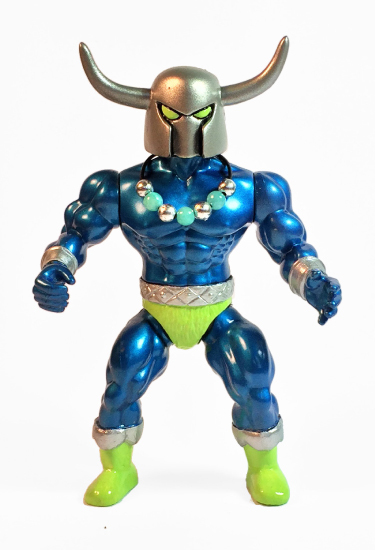 Cyborg Space Barbarian Kromulus is a 5.5" art figure that features a head sculpted by Ben Spencer, which was then cast in resin by Marty "The Godbeast" Hansen and True Cast Studio. 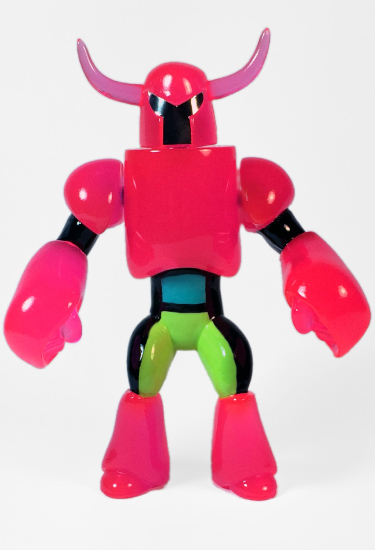 The figure features a custom painted Zoloworld body, which sports 5 points of articulation. Kromulus comes with an Omega Matrix Orbs necklace accessory. This figure is limited to an edition of 3 and they will be $75 each from The Nerd City booth in The Block at C2E2 (April 24-26 in Chicago, IL). I will have quite a few more exclusives to announce in the next month or so, so stay tuned to the Galaxxor blog for all of the latest and greatest! Shortly before a devastating meteor impact on Planet Prehis, a team of soldiers and scientists of the Lazer-Saur race were sent into space to find a place that was told to be the source of life. This fabled place was the so called "Forbidden Zone", palladium of the Prima Materia, which was protected by an ancient ape civilization known as the Holo Apes. The Lazer-Saurs had to construct the ultimate weapon to stand against an almost invincible force. They created the Tricera-Tanks: powerful, fully robotic dino warriors! 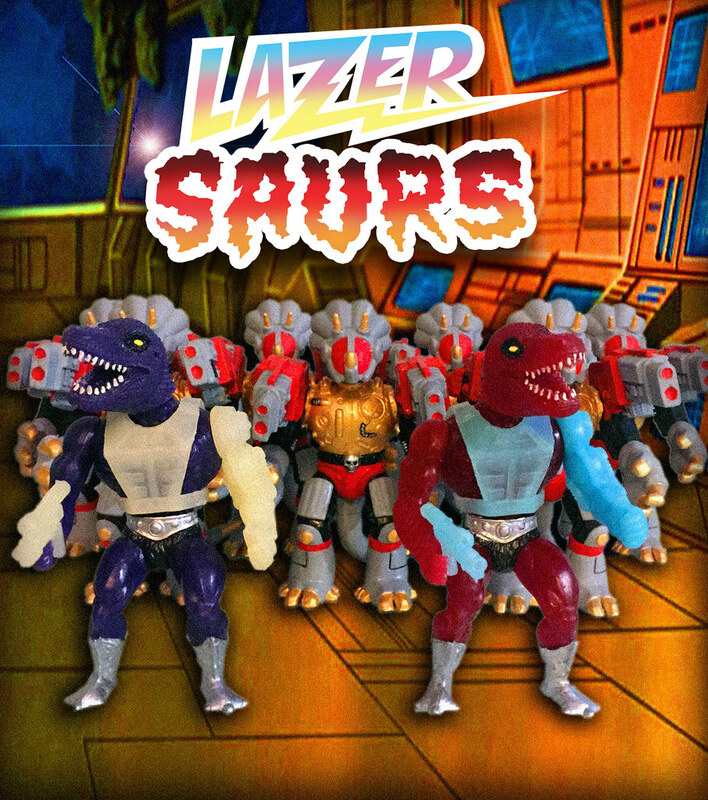 The Tricera-Tanks are the Lazer-Saurs last hope to defeat the Holo Apes, gather the essence of life, return to their home planet, and to save Prehis from its fate. Bio courtesy of Goodleg Toys. Don't forget to grab your very own Tricera-Tank this Friday, 02.06.15 at noon CST from The Galaxxor Online Store. Tricera-Tank Art by JB Roe! When planning the drop for the Lazer Saurs Tricera-Tank, I knew that I wanted to do something extra special, in terms of art. Luckily, one of my favorite artists, and a dude who was perfect for the job just so happens to be a very good friend of mine. JB Roe has a really striking art style that lent itself wonderfully to the subject matter of hulking, clockwork triceratops tank men. Originally just setting out to include a character image for the header cart art, we decided that this image was just too cool not to include as a full art print. So, each of the Tricera-Tank figures that drop this Friday, 02.06.14 at Noon CDT, will also include an extremely limited edition high quality 8"x10" art print of JB's work. JB really knocked it out of the park with this one, but you're totally cheating yourself if you don't head over to his official page and check out the scope of amazing stuff he's done. 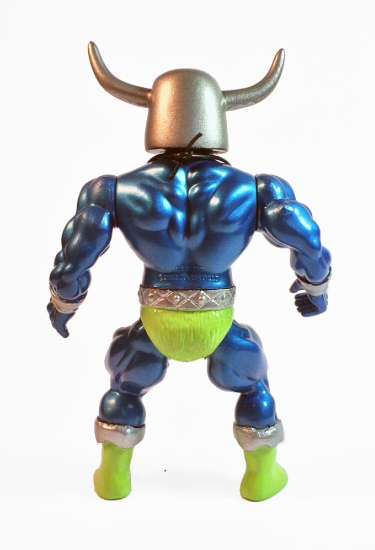 And remember, Tricera-Tank, my collab twith Goodleg Toys drops this Friday, 02.06.15 at noon CDT from The Galaxxor Online Store. The term "evil genius" gets thrown around an awful lot, these days. It most certainly applies, however, to my good friends in Germany, those maniacs from Goodleg Toys. 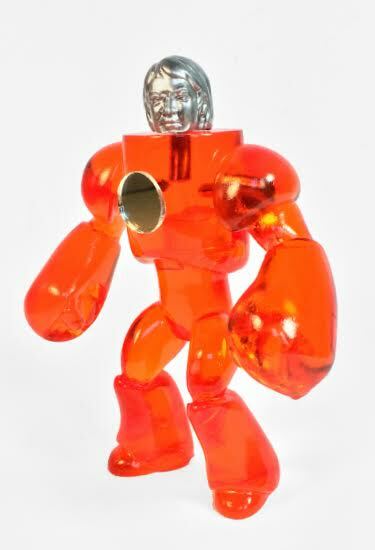 Luke and Pablo's resin creations run the gamut from pop art pieces to proper action figures, from absurdly hilarious to grotesquely badass.More often than not, their highly sought after chunks of resin are a bit of all of the above. Following our Grape-Apes collab, Luke and I were really excited about following it up with something even more involved. 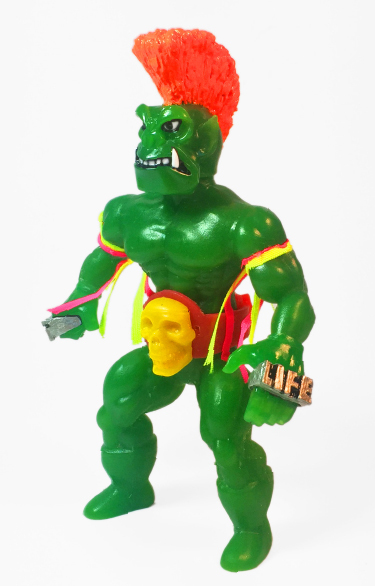 I've been a long time fan of Goodleg's War On Prehis property, a line full of zombie cyborgs and bionic dinosaurs, all done in the classic 5.5" scale. So, the idea came about to maybe try my hand at adding a figure to that extended universe. 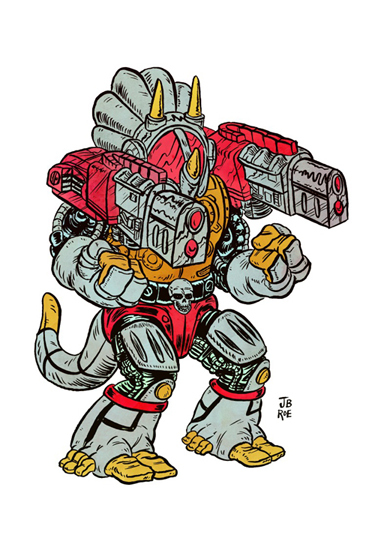 Goodleg and Kaiju Lab's Lazer Saurs were a subline of Prehis that I always particularly dug, and, after much contemplation, the concept of a gigantic, hulking, clockwork Triceratops tank man seemed like the the only right thing to do. Working in another universe, with an aesthetic that is decidedly different from the Galaxxorverse was really creatively inspirational, because it forced me to think about some of the iconic design elements that I play with, and then turn them on their ear. Prehis has a far more gritty and detailed visual than I typically work with, and that pushed me a bit out of my comfort zone. I allowed myself to mash together bits of various iconic figures, along with a bit of sculpting, and come up with a Frankenstein of a beast, which, chile working on it, I often referred to as "An Excercise in Absurdity". I'm extremely pleased with the resulting figure, one which I feel straddles the line between my aesthetic and Goodleg's aesthetic. Tricera-Tank is a hulking 5.5" resin figure. He features three points of articulation, at the shoulders and tail. That's right, the tail! Tricera-Tank was mashed up and re-sculpted by Ben Spencer, produced in resin by Goodleg Toys, and hand painted by Ben Spencer. 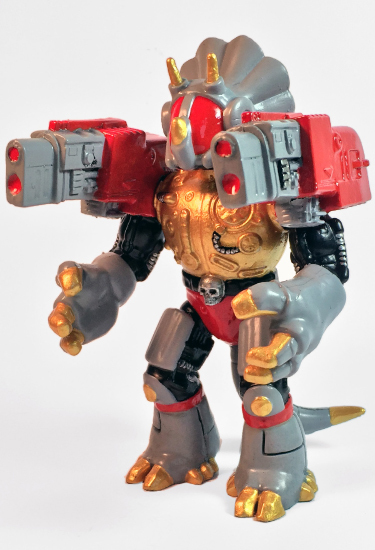 This version of the Lazer Saurs Tricera-Tank is limited to an edition of 5. It will never be produced in this colorway ever again. It will come in with two War on Prehis mini comics, and will be packed in a traditional bag and header packaging by JB Roe. But wait, there's more! Each Tricera-Tank will come with an extremely limited, high quality print of the JB's insanely cool art. Tricera-Tank will be available for $95 each, on 02.06.15 at noon CDT from The Galaxxor Online Store. Can't get enough Tricera-Tank? Stay tuned to the blog this week for full reveal of JB's insanely cool Tricera-Tank art and Luke from Goodleg's Trucera-Tank bio!